Seasonal Occurrence: Uncommon winter and spring. 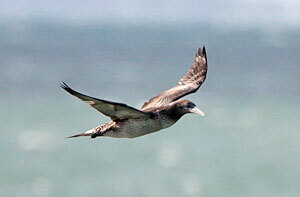 Notes: Northern Gannets are a huge seabird, roughly the same size as Magnificent Frigatebirds. They are usually only spotted in the air as they spend most of their lives at sea. They breed in large colonies on the cliffs of a few islands off the Canadian Atlantic coast. Adults are white with black wingtips. Juveniles are dark with light spots. Acquiring adult plumage takes at least 3 years.